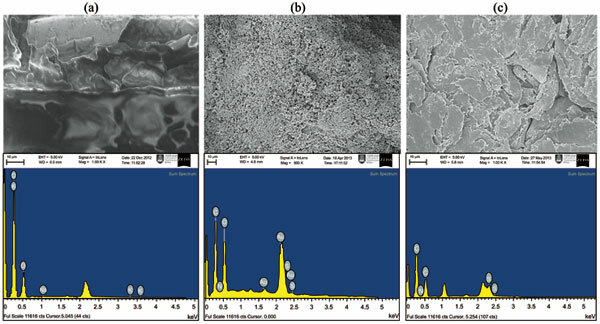 Background and Objective: This research investigated the application of three types of adsorbents derived from spent grated coconut (Cocos nucifera) powder; hexanewashed (HSGC), sulphuric acid treated (SSGC) and xanthated spent grated coconut (XSGC), to adsorb Pb(II) from aqueous solutions. The adsorbents were characterised by spectroscopic and quantitative analyses. Methodology: Different chemical treatments had changed the physicochemical characteristics of all adsorbents, namely the CHNOS content, pHslurry, and pHPZC. The morphology of SSGC had become spongy-like whereas XSGC had formed a flake-like structure. Elucidation of chemical characteristics of the adsorbent surface by Fourier transform infrared (FTIR) spectroscopy revealed the different types of functional groups. Result: The performances of all adsorbents were affected by pH and initial concentrations of Pb(II). The rate of Pb(II) uptake was rapid. The adsorption of Pb(II) on all adsorbents was best fitted to pseudo-second order kinetic models (R2 > 0.99) and Langmuir isotherm model (R2 > 0.99). The Langmuir adsorption capacities (qcal.max) for Pb(II) by HSGC, XSGC, and SSGC were 37.88, 49.02 and 172.41 mg/g, respectively. Conclusion: The thermodynamic study revealed that the adsorptions were endothermic with spontaneous and feasible process as the ΔGo values were negative. Ion exchange, ionic attraction and complexation were the dominant mechanisms involved in the Pb(II) adsorption. Adsorption, kinetics, isotherm, mechanisms, thermodynamics, spent grated coconut.